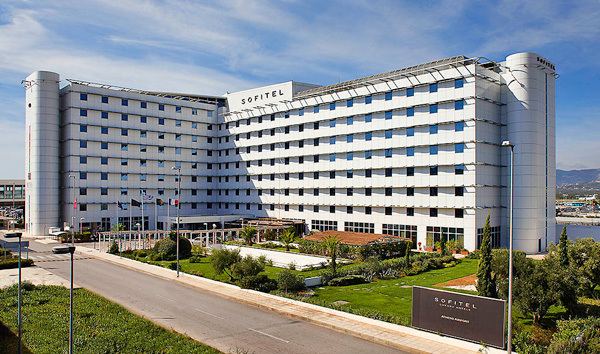 Located just opposite the Athens Airport “Eleftherios Venizelos”, a few steps away from the arrival and departure halls, Sofitel Athens Airport combines all the convenience of an airport hotel with the architectural beauty and gracious accommodations of a first class establishment. Managed by the well-known ACCOR GROUP, the hotel is classified as a five-star international standard. Within walking distance from the Main Terminal Building, this venue is ideally situated at 5km from the nearest beach, 12km from the port of Rafina, 35km from the port of Piraeus, within close proximity to lots of fascinating rural and historic locations and 25km from the archaeological and shopping centre of capital Athens. For a rendezvous with exceptional luxury and the highest standards of accommodation, the soundproofed guestrooms offer all the advantages of an international class hotel, adopting the very best of local traditions. Extending a discreetly personal welcome from the host country, the Sofitel Athens Airport makes guests feel instantly at home at any time, under all circumstances. Going even further, the hotel adds a subtle art de vivre expressed in the refined interior decor, the perfect melding of materials, the feeling of well-being and the warmth of true hospitality. Expertly furnished with plush and luxurious furnishings, the 345 standard and deluxe guestrooms are appointed with modern amenities, including interactive TV system and high technology communications requirements, satellite/cable TV, radio, safe, “en suite” bathrooms and WCs, mini bar and refrigerator. Guests requiring privacy and personalised services have the privilege of the Executive Floor with separate check in/out, concierge facilities and complimentary use of the Executive Lounge. The Sofitel Athens Airport embodies the very best of hospitality in the elegance of its interior design, the warmth of the welcome, the sophistication of services and the art of exceptional cuisine. In Greece fine dining is as varied as it is plentiful, and the Sofitel Athens Airport reflects this tradition. Offering an atmosphere of refined elegance, traditional and creative cuisine and a comprehensive range of services, the hotel boasts superb restaurant facilities including a 350sq.m. modern Mediterranean restaurant and a 300sq.m. panoramic restaurant. Both facilities feature a wide array of Mediterranean and international specialities and exquisite wines, expertly served by a highly trained culinary staff committed to bringing guests the most superb dining experience. The Sofitel Athens Airport boasts a string of facilities ranging from an indoor heated pool and fully equipped health club with steam and sauna rooms for fitness and relaxation, to a beauty salon, 24-hour security and front desk service, two cocktail bars, an airline desk, car rental, babysitting, laundry/dry cleaning services, translation services, exchange facilities, concierge, tourist information desk and private underground parking. Planning a conference or a banquet at the Sofitel Athens Airport is much more than an exceptional experience. Here guests can always find all the strategic resources required for business, whether it is setting up an advance outpost for a company in a foreign country or organizing a high-profile event. The hotel boasts a 1000 sq.m. conference space, including eleven flexible conference rooms with maximum capacity of up to 700 persons. Appointed with sophisticated sound and audio-visual equipment and facilities, the purpose-designed luxurious meeting/function rooms comprise a business area with assistance, copiers w/printers, computers, facsimiles and secretarial services. The invaluable experience and meticulous attention to detail provided by the professional staff assists in making this establishment a great business centre in the heart of the Athens airport. The hotel's specially trained meeting organizers will listen carefully to customer's needs and provide hands-on support throughout the event to make it a resounding success, while, equally indispensable, customized catering services are available for everything, from a simple coffee break to a prestige reception.